Meet Alice. I’ve always loved that name. It was my Grandma’s name. I was very taken by this painting when I saw it on ebay. So I was very happy that I won this one. I paid a little more than I would have liked this time, but when you want something, you can’t let a few annoying, persistent bidders deprive you of it. It is oil on card. It has no signature, so there’s no clue of the painter. The unpainted corners of the top but not the bottom suggest that it may have been cut down at some point, perhaps to fit a frame. There’s something quite melancholic about this painting. I don’t know why, but I get the feeling this was painted in memory of the girl after death. The clues being, the turbulent sky, her calm, wistful, innocent, far away look, and the golden locket on a black choker around her neck. Lockets to me always signify remembrance, and this one is almost incongruous. It’s prominence seems to be making a statement. I’m wondering if this locket was worn by Alice’s mother to remember Alice by after her passing. The design is curious. Does it show St Andrew’s Cross? Is the setting therefore Scotland? 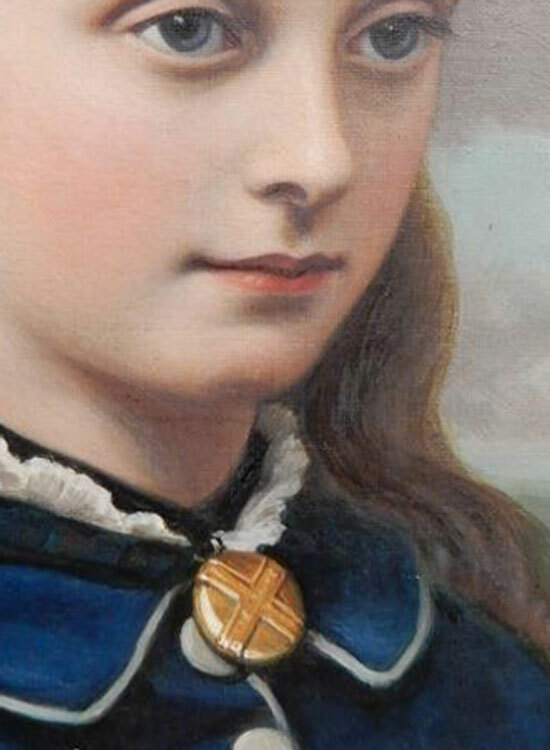 Other clues to suggest that Alice may be Scottish, her red hair, the hint of plaid fabric just below the white frill. Tenuous I know! But it all helps to colour in the missing information. So here is Alice, a young, Victorian, Scottish girl portrayed in her favourite place, on a moor overlooking the sea, possibly her final resting place.